Rhubarb is one of the first things we can get from the land in volume this time of year, especially because it is a perennial. Before inheriting several plants that were already here when we bought our property, I hadn’t really thought much of rhubarb. The only thing I ever heard people make was strawberry rhubarb pie, and I didn’t much care for it. But then we saw the abundance that this hardy plant produces… and we had to use it in more ways. As I may have mentioned before, the Rustic Fruit Desserts book by Cory Schreiber and Julie Richardson* is a dangerous item to have around the house. Blame it for eating too much dessert, and for too much homemade vanilla ice cream. Not only do you learn about the terms “buckle” and “pandowdy” and such, you can make many of these recipes year round with frozen fruits. This can make a long Montana winter so much livelier! And homemade vanilla ice cream is a must. Store-bought ice cream, especially vanilla, can seem to sugary sweet to me. By making it at home, which is super easy with a machine, you can adjust the sugar and this really brings out the creaminess of the end result. 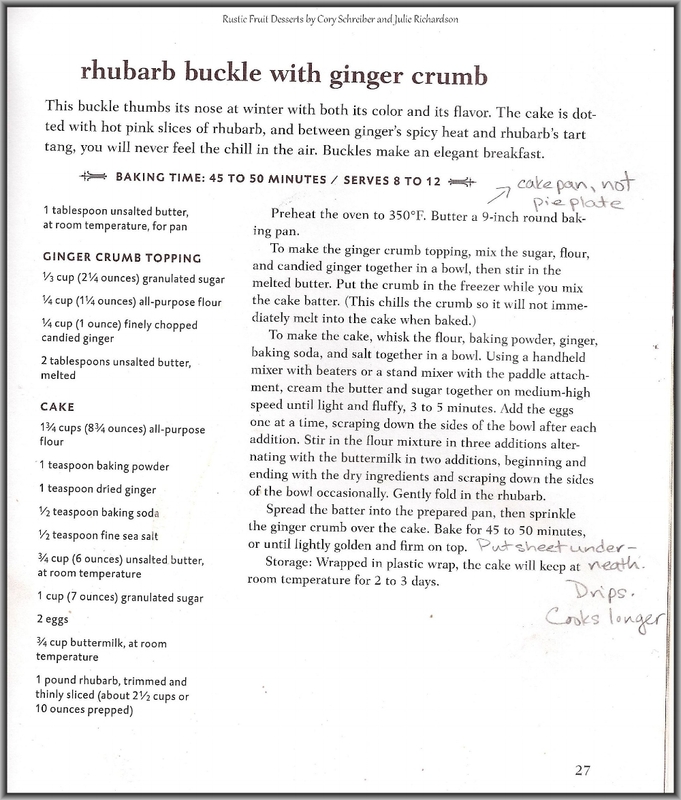 The Rhubarb Buckle with Ginger Crumb is Micah’s favorite. Our substitute for buttermilk is regular whole milk with a bit of lemon juice added in. Stir and let it sit for a few minutes while you prep the rest of the ingredients. We find that this recipe takes quite a lot longer to bake, maybe because of the frozen fruit. We just keep checking it with a toothpick. Lemon Buttermilk Rhubarb Bundt Cake... this picture makes it look a bit dowdy, but it's heavenly. The Lemon Buttermilk Rhubarb Bundt Cake is my favorite. And a bundt cake pan just makes everything look a bit fancier. See my note about making half the glaze-- we find that the whole amount is just too much. Finally, the Rhubarb, Oat, and Pecan Crumble is quick to make and results in a 9 x 13 pan full, which is quite a lot. I made this yesterday and found myself grabbing a spoonful every time I was in the kitchen… see, I told you it was dangerous! Then there are Rhubarb Cocktails. Make this Rhubarb Simple Syrup and enjoy cocktails all year long. We like the Rhubarb 75 Erica from NW Edible lists at the end of the recipe, or make a sweet pink soda without the booze. Save the remaining super sweet rhubarb mash as a topping for pancakes or over ice cream. But it won’t keep long in the fridge. Combine in a heavy saucepan over medium high heat until sugar dissolves. Bring to a boil. Reduce heat. Simmer until thickened, about 20 minutes. Stir to prevent scorching. Water bath can or freeze. Also great on ice cream or use as a glaze for chicken. Or add to oatmeal, yogurt, etc. In addition, she forward to me this link about the sound of rhubarb. It makes a sound?! And if all of this is just too much right now with the press of spring, rhubarb can be easily frozen. Harvest, chop and freeze. Use it all winter long!! And if you don’t have your own plant in your yard, borrow some rhubarb from a friend or neighbor. Likely they aren’t using it all, or sad to say, perhaps haven’t discovered the bounty of yumminess. Pinch back the seed heads if it wants to go to seed and this will prolong the season. Or dig up a portion of a tuber and move it to your house. It will take year or so to get established, but then nothing can stop it. Free food! *I have purchased this book in the past at Shakespeare and Company here in Missoula. They tell me they will order a few more in!